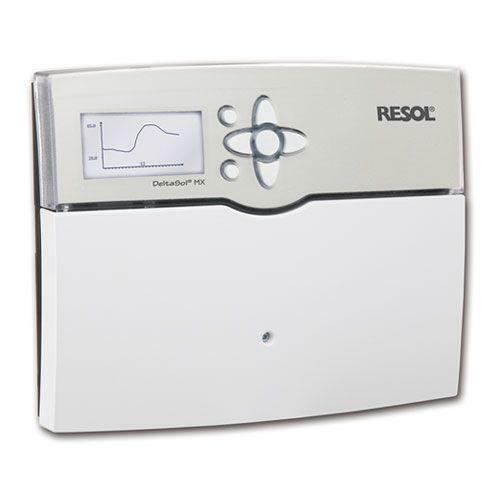 The RESOL DeltaSol® MX system controller is the most advanced heating controller available with features that will allow over 1,000,000 combinations of configuration. All on an easy to program LCD screen. The MX controller is ideal for combining different heating sources including heat pumps and solar thermal. It can control up to 14 zones and has 19 sensor inputs inlcluding variable speed pumps with PWM inputs and Grunfos Direct Sesors. The buit in SD card can store data or it can be uploaded to the free Vbus.net for customized layout and live webviewing.